Spider belongs to the "Arachnids". In Europe there are mainly five common arachnid families. Apart from Araneae (Spiders), these are: Acari (Ticks and Mites), Opiliones (Harvestmen), Pseudoscorpiones (Pseudoscorpions) and Scorpions. Click for more info/photos about arachnids. 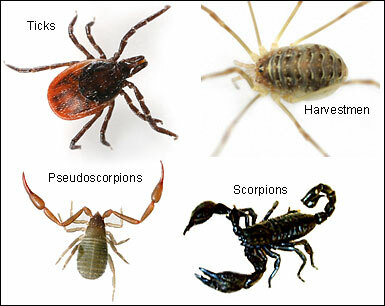 Apart from these families there are also Amblypygi (Tailless whipscorpions), Palpigrade (Micro whipscorpions), Ricinulei (Hooded tickspiders), Schizomida ("split middle" whip scorpions with divided exoskeletons), Solifugae (Wind scorpions, Camel spiders, Sun spiders), Uropygi (Whiptailed scorpions, Vinegaroons). Spiders belongs to the "Arachnids".